Analysis: Thielen bounced back nicely from last week's 19-yard effort, posting his highest receiving yardage total since Week 12 and second highest since Week 8. He's slowed down dramatically after a historically hot start to the season, but Thielen should remain involved against the Bears in Week 17 with his Vikings trying to clinch a playoff spot. Analysis: After eclipsing 100 receiving yards in eight consecutive games to start the season, Thielen has done so only once over the past six, coming up short of 30 yards three times. Despite his recent decline in production, it will be tough to take Thielen out of the lineup against the Lions in Week 16, considering his robust totals of 105 catches for 1,255 yards and nine touchdowns this season. Analysis: Thielen briefly exited the game after getting his ankle rolled up on in the fourth quarter, but returned on the subsequent series. He could face limitations in the coming week of practice, so keep an eye on his status in advance of Week 15's home matchup against the Dolphins. Analysis: Thielen has been held in check for a vast majority of Monday's contest, hauling in only three of five targets for 23 yards and adding one rush for eight yards. The stud wideout appeared to have his ankle rolled up on by Shaquill Griffin on a pass breakup in the fourth quarter. Laquon Treadwell would be in for a larger role if Thielen is forced to miss the rest of the game. Analysis: While there was never much concern about Thielen's availability, fellow wide receiver Stefon Diggs (knee) is listed as questionable after managing just one limited practice this week. A Diggs absence might push a few extra targets in Thielen's direction, but it would also allow the Patriots to shift their focus even more toward the middle of the field, where the 28-year-old does his best work. Either way, Thielen is safely established as a top-10 wideout play each and every week. Analysis: For the third week in a row, a calf injury was attached to Thielen, inducing a cap on his practice reps. Expect him to be cleared on the Vikings' final injury of Week 13, as he has been before both of the team's previous two games. Assuming he is, Thielen will face a Patriots defense Sunday that has yielded 7.5 YPT and 12 touchdowns to wide receivers this season. Thielen (calf) was a limited participant during Wednesday's practice. Thielen brought in eight of nine targets for 125 yards and a touchdown in Sunday's 24-17 win over Green Bay. 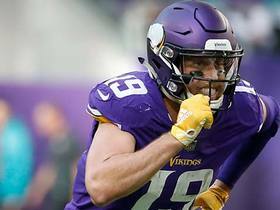 Analysis: After starting the season with a record-breaking eight straight 100-yard games, Thielen had fallen into a mini slump with just 88 combined yards over his previous two. The 28-year-old got back to his WR1 ways and even made a highlight-reel leaping catch in double coverage to secure a huge gain in the second quarter. 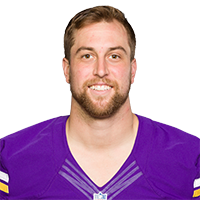 Next week's opponent, the Patriots, surrender 381.4 yards per game to opposing passing offenses, so Thielen has a solid chance to post another huge stat line in Week 13. Thielen (calf/back) doesn't have an injury designation for Sunday's game against the Packers, Michael Cohen of The Athletic reports. Analysis: Thielen upgraded to full participation Friday after logging limited practices Wednesday and Thursday. He burnt the Packers for a 12-131-1 receiving line on 13 targets back in Week 2, marking his second of eight straight games with triple-digit yardage. Thielen was held to 88 yards on 19 targets over the past two weeks, but he should get back on track against a Green Bay defense with serious injury concerns. Thielen (calf/lower back) was listed as limited on the Vikings' injury report Thursday. Analysis: With back-to-back listings of "limited" this week, Thielen is following his precise regimen from Week 11 prep, when he was eventually cleared on Friday's report. This past Sunday at Chicago, he logged his usual significant snap count (all 67 on offense) en route to gathering in seven of 12 passes for 66 yards. The Vikings' final Week 12 practice report will reveal if Thielen is ready for a similar workload for Sunday's showdown against the Packers. Thielen (calf/lower back) was a limited participant during Wednesday's practice. Analysis: The same injuries resulted in Thielen logging limited practice reps last Wednesday and Thursday, but he ultimately suited up in Sunday's 25-20 loss to the Bears and made seven catches for 66 yards. Thielen handled a normal snap count in that contest and didn't report any injury-related setbacks heading into this week, so the assumption is that his restrictions Wednesday were mainly for maintenance purposes. 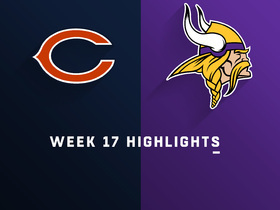 Thielen caught seven of 12 targets for 66 yards in Sunday's 25-20 loss to the Bears. Thielen (lower back/calf) isn't listed on the Vikings' final injury report ahead of Sunday's game in Chicago. Analysis: Coming out of a bye week, Thielen never seemed to be in any real danger of missing this crucial contest. He gets an interesting Week 11 matchup against a Chicago defense that has given up the eighth-most receiving yards per game to wideouts (177.6) this season, despite the fact the unit is playing at a high level as a whole. Thielen (lower back, calf) practiced in a limited capacity Thursday, Chad Graff of The Athletic reports. 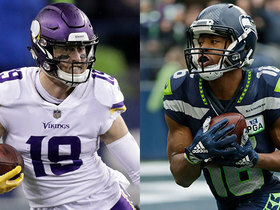 Analysis: During the part of Thursday's session open to the media, Thielen worked with the wide receiver group, but that was the extent of his activity, per Courtney Cronin of ESPN.com. Thielen has one more day to alleviate concerns about his health, with Friday's injury report providing the last word on his potential to play Sunday night in Chicago. Thielen was a limited practice participant Wednesday due to calf and lower-back injuries. Thielen caught four of seven targets for 22 yards and a touchdown while adding a five-yard carry in Sunday's 24-9 win over the Lions. Thielen hauled in all seven of his targets for 103 yards and a touchdown in Sunday's 30-20 loss to New Orleans. Thielen caught nine of 10 targets for 110 yards and a touchdown in Sunday's 37-17 win over the Jets. Analysis: Thielen continued his historic pace with another superb performance, capping the opening drive with a 34-yard touchdown on his way to a seventh consecutive game over 100 receiving yards to start the season. One more performance over 100 yards would tie Calvin Johnson's NFL record of eight straight such games. Thielen will have a great chance to do so against a vulnerable Saints secondary in Week 8. Thielen caught 11 of 15 targets for 123 yards and a touchdown during Sunday's 27-17 win over Arizona. Analysis: Thielen extending Minnesota's lead early in the second half, splitting the middle of the field for a 13-yard touchdown in the back of the end zone. Thielen has now scored in four of six games and has at least six catches and 100 yards in every game this season. He is as reliable an option as you can find this point, particularly on Sunday against a Jets defense surrendering 292 receiving yards per game. Thielen caught seven of 10 targets for 116 yards and a touchdown during Sunday's 23-21 win over the Eagles. Thielen brought in eight of 12 targets for 135 yards and a touchdown in the Vikings' 38-31 loss to the Rams on Thursday night. Analysis: Thielen checked in second on the team in targets to Stefon Diggs, but he paced the Vikings in receiving yardage. Thielen brought in a perfect 45-yard scoring strike from Kirk Cousins late in the third quarter for his second touchdown over the last three games. The 28-year-old has eclipsed the century mark in yardage in each game thus far this season, thrilling fantasy owners in all formats. He'll look to continue the excellent start to his season against the Eagles in Week 5. Thielen caught 14 of 19 targets for 105 yards during Sunday's 27-6 loss to the Bills. Analysis: Thielen was peppered with passes as his team played from behind virtually all day, finishing first on the team in targets, catches and yards. He went over 100 receiving yards for the third straight game to start the season, though most of his receptions were of the short variety and he averaged just 7.5 yards per catch. 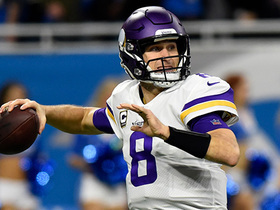 Still, it's clear who the top option in the passing game is for Kirk Cousins, though his rapport with Thielen will be tested Thursday against the Rams. Thielen caught 12 of 13 targets for 131 yards and a touchdown during Sunday's 29-29 tie with the Packers. Thielen brought in six of 12 targets for 102 yards in Sunday's 24-16 win over the 49ers. Analysis: Thielen drew even with Dalvin Cook for the team lead in receptions while pacing the team in receiving yardage. The fifth-year receiver was only able to bring in half of his passes from new quarterback Kirk Cousins, but the two displayed solid rapport overall and figure to only up their chemistry as the season unfolds. Thielen will look to build on a productive season-opening effort in a divisional clash Week 2 against the Packers. Thielen (leg) wasn't listed on the Vikings' Week 1 injury report Wednesday. 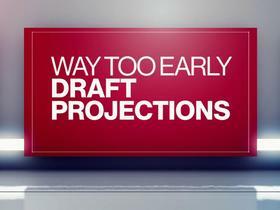 Thielen (leg) likely will spend a lot of time in the slot this season, Tom Pelissero of NFL.com reports. Thielen (leg) isn't believed to be dealing with a "long-term concern," Andrew Krammer of the Minneapolis Star Tribune reports. Analysis: Per Krammer, Thielen is "good" after hurting his left leg at Tuesday's practice. Backing up this source, Thielen walked off the field under his own power. Any injury of particular severity would elevate Stefon Diggs to the top of the wide receiver depth chart, but Thielen has plenty of time to get healthy in advance of the Vikings' regular-season opener Sunday, Sept. 9 versus the 49ers. Thielen turned his ankle during practice Tuesday, Ben Goessling of the Minneapolis Star Tribune reports. Analysis: Per the report, Thielen was able to walk off on his own power, but the issue forced him to leave Tuesday's practice, at which point Kendall Wright took first-team wideout reps in Thielen's place. Thielen had four receptions for 26 yards on six targets in Friday's preseason win over Seattle. Analysis: Thielen and Kirk Cousins haven't seemed to get in sync during the preseason, but we wouldn't be too worried as Thielen should be a key cog in the offense once the regular season begins. Thielen didn't have a reception despite three targets in Saturday's preseason loss to Jacksonville. Analysis: We wouldn't get too worried as Minnesota's first-string offense looked flat against a tough defense in their four series. Thielen has meshed well with new quarterback Kirk Cousins by all accounts in training camp, so we wouldn't want to read much into his preseason stats. 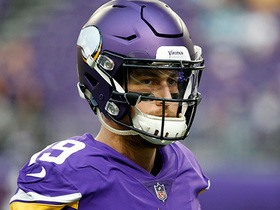 Thielen and fellow wideout Stefon Diggs traveled to Atlanta in early April to spend time with new Vikings starting quarterback Kirk Cousins, Chris Tomasson of the St. Paul Pioneer Press reports. Thielen confirmed Wednesday that he played through a pair of back fractures in the Vikings' NFC championship loss to the Eagles on Jan. 21 but doesn't expect to face any limitations during the offseason, Courtney Cronin of ESPN.com reports. Analysis: Thielen, who caught three passes for 28 yards on nine targets against the Eagles, went on to suit up for the NFC in the Pro Bowl last weekend, which seemingly supports the notion that his back injury isn't especially worrisome. The wideout said he doesn't anticipate any scheduling setbacks in the months leading up to Organized Team Activities and training camp, setting him up for a rather normal offseason. Thielen (back) is active for Sunday's NFC championship game in Philadelphia. Thielen will attempt to play through back fractures during Sunday's NFC championship game at Philadelphia, Andrew Krammer of the Star Tribune reports. Thielen (lower back), who is listed as questionable for Sunday's NFC championship game against the Eagles, is set to play in the contest, a source informed Andrew Krammer of the Minneapolis Star Tribune. Thielen (lower back) will be listed as questionable for Sunday's NFC championship game against the Eagles. Thielen (lower back) practiced in a limited capacity Thursday. Analysis: The listing follows Thielen's return to drills, signaling he's taking the necessary steps to ensure he's available for the NFC championship game. Ultimately, Friday's injury report will have the final say on his potential to suit up Sunday, when the Vikings will be facing the Eagles' 17th-ranked pass defense. Thielen didn't practice Wednesday due to a lower back injury. Analysis: During the open portion of practice, Thielen watched from the side without a helmet in hand, per Courtney Cronin of ESPN.com. However, the notion that Thielen's absence was maintenance-related was backed up by Kevin Seifert of ESPN.com, who relayed the injury "is not believed to be serious." Ultimately, the next two days will provide an indication of Thielen's availability for Sunday's NFC championship game at Philadelphia. Thielen (undisclosed) wasn't active at the portion of Wednesday's practice open to the media, Courtney Cronin of ESPN.com reports. Analysis: While he was in attendance, Thielen wasn't holding a helmet, so it appears he's getting the day off for one reason or another. If his health is compromised, it will be revealed upon the release of Wednesday's injury report. Thielen caught six of nine targets for 74 yards during Sunday's 29-24 NFC divisional-round victory over the Saints. Thielen caught two of six targets for 24 yards during Saturday's 16-0 victory over the Packers. Thielen had three receptions on five targets for 30 yards in Sunday's 34-7 win over the Bengals. Analysis: Thielen and Minnesota's receivers had a low-key game after it quickly became a blowout with the running game getting most of the action. He'll likely be a bigger focus of the offense next week at Green Bay. Thielen (knee) doesn't have a designation on the final injury report for Sunday's game against the Bengals. Analysis: Thielen was limited at Wednesday's practice but returned to full participation Thursday and Friday. Already accounting for 27.9 percent of the Vikings' targets, Thielen could push for an even higher portion this weekend in the likely absence of TE Kyle Rudolph (ankle-doubtful). Thielen (knee) practiced fully Thursday. Analysis: Thielen made a surprise appearance on Wednesday's injury report, getting tabbed as a limited participant due to a knee issue. With his elevation to a full session Thursday, the previous day's limitations appear to have been maintenance-related. Thielen will now focus on a Bengals defense Sunday that has allowed 150.5 receiving yards per game and three touchdowns to wideouts over the last six contests. Thielen was listed as a limited participant during Wednesday's practice with a knee injury, Courtney Cronin of ESPN.com reports. Thielen caught six of 13 passes for 105 yards and a touchdown in Sunday's 31-24 loss to Carolina. Thielen caught four of five targets for 51 yards during Sunday's 14-9 win over the Falcons. Analysis: Thielen hauled in all but one of the passes thrown his way, but limited targets and a few short gains limited him to his fourth-lowest yardage output of the season. 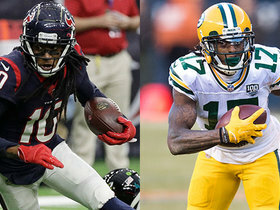 Still, he tied for the team lead in targets as Case Keenum spread the ball around to nine different pass catchers. Thielen had averaged an impressive 119 yards per game over the previous four and will look to get back on track next week against the Panthers. Thielen caught eight of 11 targets for 89 yards during Thursday's 30-23 win over Detroit. Analysis: While it's a little disappointing that Thielen's touchdown streak ended at three games, this checks out as another solid showing from the go-to receiver. He's up to 27 receptions, 476 yards and three scores through the past four weeks, and he's also paced the Vikings in targets during that stretch. With reliable receivers in decline across the league, Thielen checks out as a rare option who can be started confidently week in, week out. Thielen brought in six of nine targets for 123 yards and a touchdown in Sunday's 24-7 win over the Rams. Thielen nabbed eight of 12 targets for 166 yards and a touchdown in Sunday's 38-30 win over Washington. 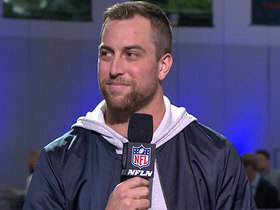 NFL Network's Mike Garafolo and Tom Pelissero talk about the possibility of a contract extension for Minnesota Vikings wide receiver Adam Thielen. Minnesota Vikings wide receiver Adam Thielen reflects on his record-setting 2018 season. Minnesota Vikings wide receiver Adam Thielen hosted a gift donation for 10 families from the Salvation Army's Pathway of Hope Program. 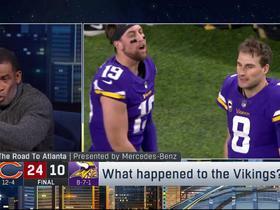 NFL Network's "NFL Fantasy Live" crew discusses the fantasy fallout from the Minnesota Vikings' Week 14 loss to the Seattle Seahawks.